We are in business for one reason. To serve you… our customers. At XBLUE, we have built the best value-priced small business phone systems on the market. Positive proof of that is the best retailers in the nation carry our products and offer them to you at the best prices. We stand behind our products with a full one-year warranty. 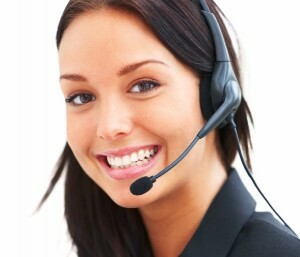 And we take care of our customers better than any other telephone system manufacturer. Don’t you hate it when companies have websites that make it impossible to actually find a phone number to call? So do we! And isn’t it maddening when you actually do find a phone number and call it, only to filter into an automated attendant queue that goes nowhere? Or worse yet, you get all the way through several minutes of prompts and entered all of your personal information requested, only to find out they can’t actually help you? Or you get disconnected? So do we! At XBLUE, we actually WANT our customers to call us. Or email us. We are here to make your XBLUE experience extremely AWESOME! Rest assured, whether you have questions about which phone system you should buy, or need help installing or programming it, we are here. Live, and in America. 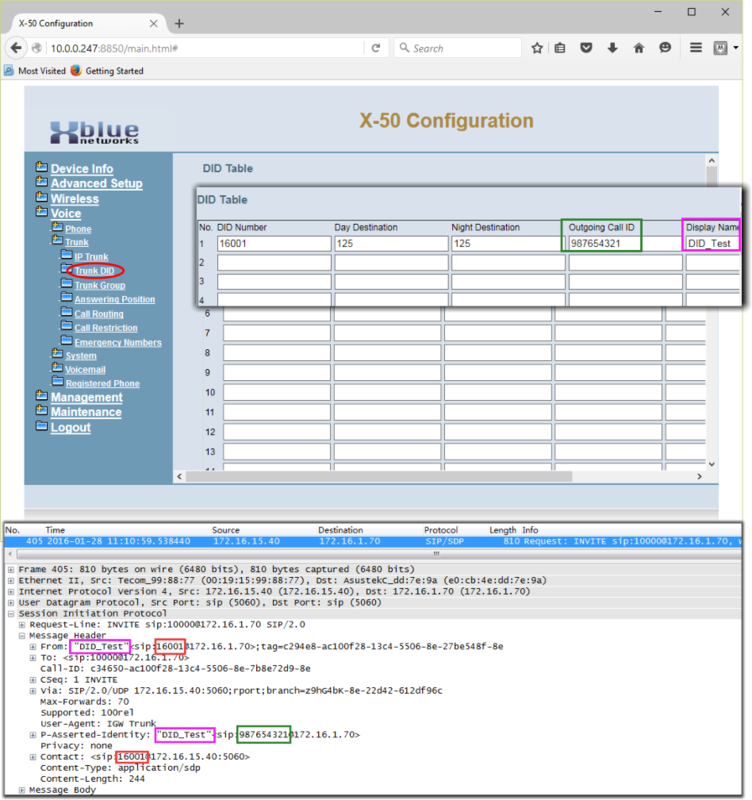 Your XBLUE Hybrid-IP Server is administered using a web-browser. 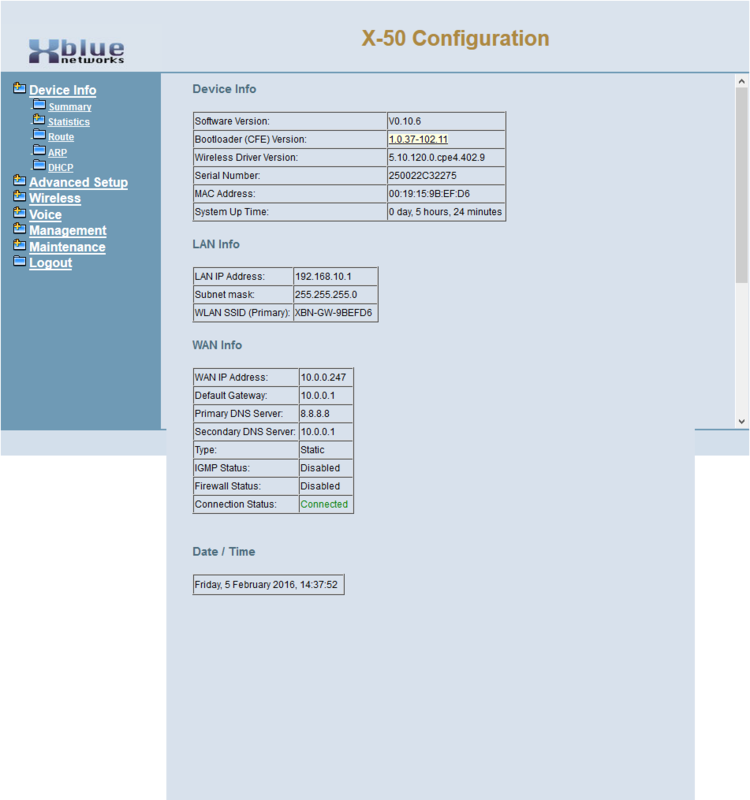 The Wizard WAN Settings page is an easy access page to set the Wide Area Network settings of your XBLUE Hybrid-IP Server. This document defines the data fields that are output as part of SIP Trunk packets and maps the data fields of the SIP Trunk programming screen to the packet components required. The examples given illustrate the data packet content using Wireshark packet screens and color-coded orientation of data in the packets to the corresponding data field in the XBLUE Server interface. Use the Voice/Trunk/IP Trunk page to input all information specific to the SIP Trunk provider requirements. This data will be P-Asserted-Identity and seen at called phones with CID capability unless the service provider setting takes precedence. Yes or No statement, is the account a registration type account? Generally the Server is unaware of connected call status. Interdigit Timeout is used to deduce the moment at which a dialed call is complete. After this timeout, SMDR and Call Log will be recorded. When “Outbound Proxy”, “Register Server” and “Outbound Registrar” are empty the required data will be auto-filled with the data input into “SIP Proxy”. 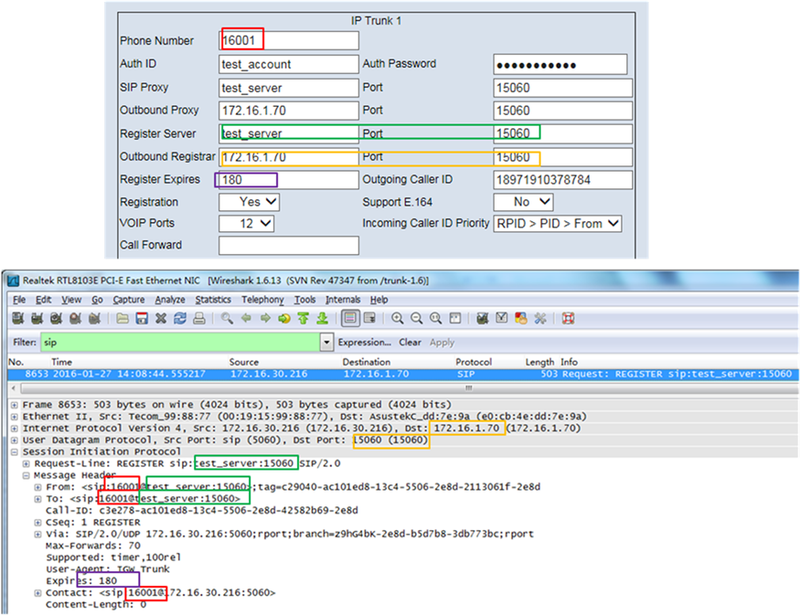 “Phone Number” is used in registration and part of the SIP packet user information “From”, “To” and “Contact” headers. “Register Server” and its “Port” are used in the host part of the “Register URI”, “From” and “To” headers. 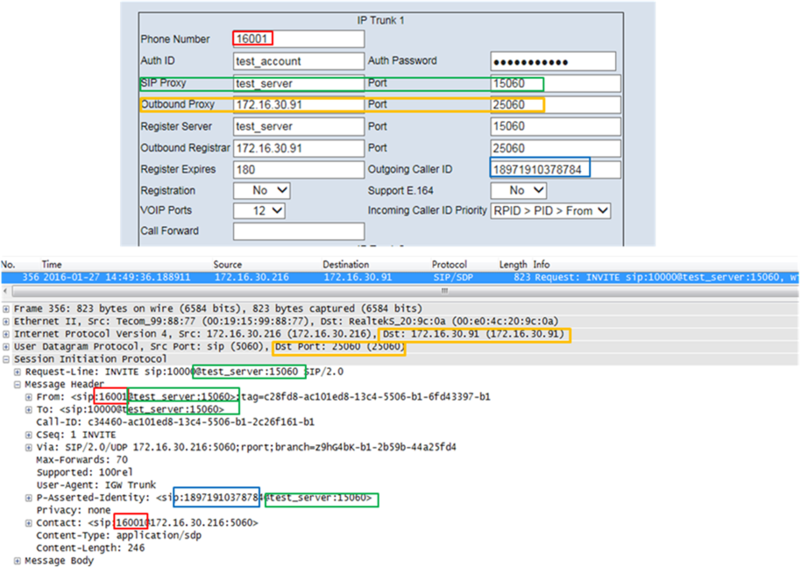 “Outbound Registrar” and its “Port” are used as the destination address of the Register packet. “Register Expires” is used in the “Expires” header. 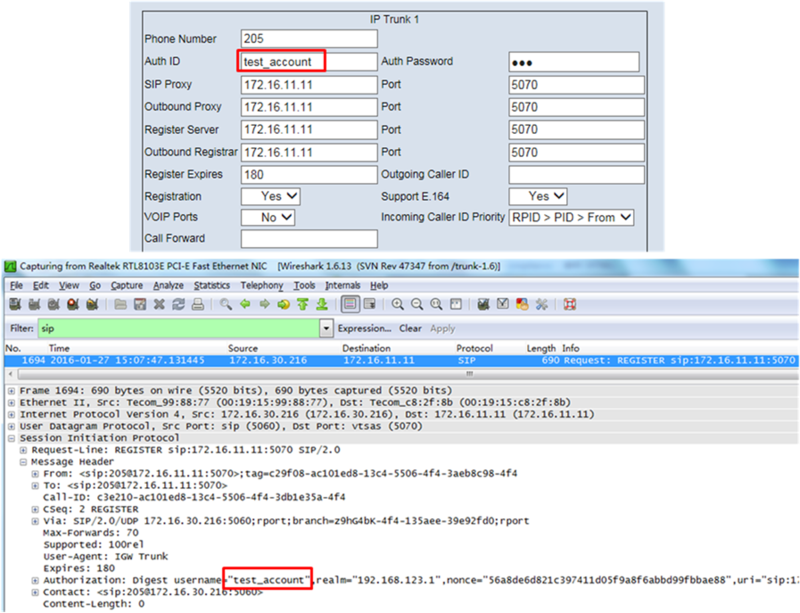 “SIP Proxy” and its “Port” are used in the host part of the Request URI, “From”, “Contact” and “P-AssertedIdentity” headers. “Outbound Proxy” and its “Port” are used in the destination address of the INVITE package. 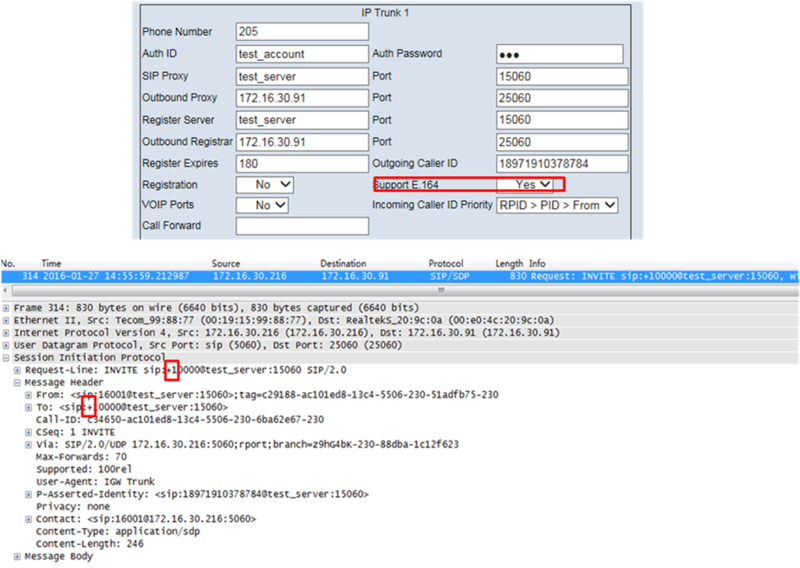 “Outgoing Caller ID” is used in the user information of the “P-Asserted-Identity” header. 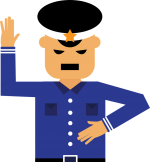 When “Support E.164” is enabled, a “+” symbol will be added to the front of the user information of the Request URI and to the “To” headers for outgoing INVITE packets. 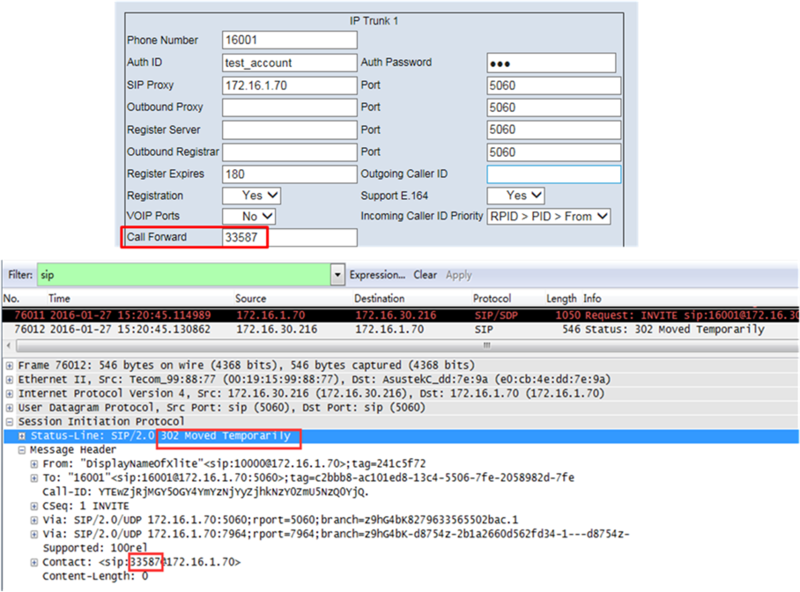 When the “Call Forward” field has a number (destination), the number will be used in the user part of the “Contact” header of 302 Response to this INVITE for an incoming INVITE packet. 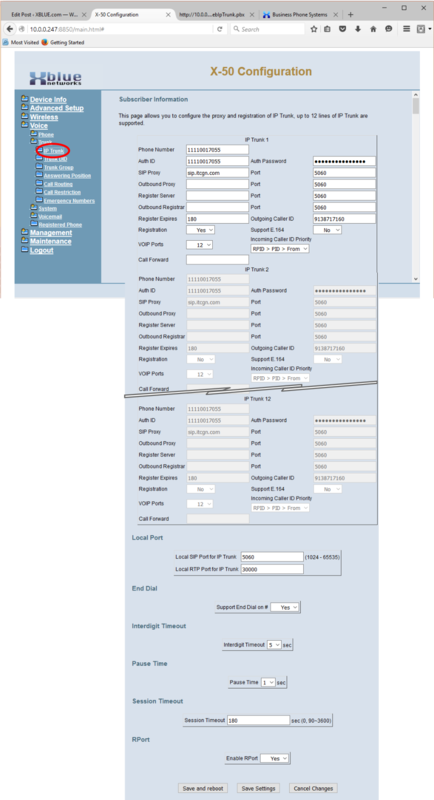 If a DID entry is matched the IP Trunk INVITE packet “Phone Number” field of this IP Trunk channel will be used in the user part of the “From” and “Contact” headers. The DID Table “Display Name” field of the DID entry will be used in the Display Name part of the “From” and “P-Asserted-Identity” headers. If a DID entry is matched the “Outgoing Call ID” field of the DID entry will be used in the user part of the “P-Asserted-Identity” header. If the “Outgoing Call ID” field of DID Table entry is empty the “DID Number” field will be used in the user part of the “P-Asserted-Identity” header. 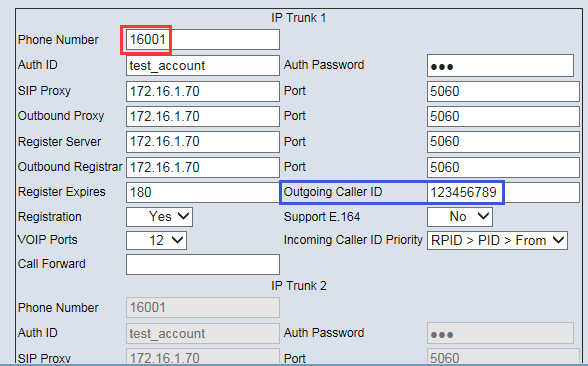 NOTE: The “Outgoing Caller ID” field of the IP Trunk channel will NEVER be used when when the outgoing call is initiated by an extension listed as a Destination for incoming calls.